People around the globe value the Boreal forest in Alberta, Canada for a number of reasons. For one, the forest represents ¼ of the earth’s remaining intact forest, and it makes up 11% of the planet’s terrestrial carbon storehouses. It’s known for its wildlife habitat, which is home to moose, bear, and endangered species such as the woodland caribou and the whooping crane. However, to indigenous peoples of the region, the Boreal forest is important because it is home. It has been their home for generations, the ancestral site of their hunting, fishing and gathering. Unfortunately, nearly every big oil company in the world has targeted the Boreal forest as a hot spot for oil, even if it is some of the dirtiest and most difficult oil to extract. The oil derived from the Boreal Forest comes from tar sands, a claylike, tar-infested mud that spans an area roughly the size of Florida. Oil companies start by clear-cutting the forest before beginning extraction through open pit mining and leaching, which requires that high temperatures and chemical solvents be applied beneath the earth’s crust. Because tar sands oil is not liquid like conventional oil, it requires tremendous upgrading before use. In fact, the tarry substance has to be dug up, sucked up, squeezed, heated, steamed, and processed through many other resource-intensive methods even to be retrieved from below the earth’s surface. The tar sands are so unique in their makeup that it requires special refineries to turn it into an ‘useful’ oil. The tar sands have become the world’s largest industrial project, dubbed as the most destructive project on the planet by the Environmental Defense Fund. Local First Nations feel the impact first and foremost because it is their homeland that is being destroyed. 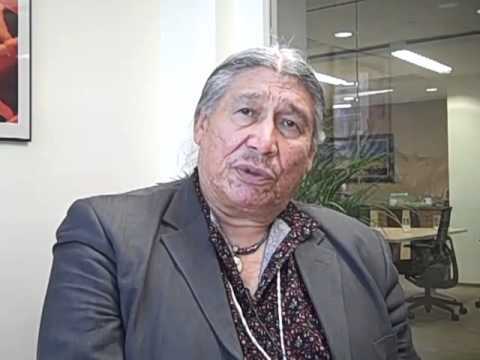 Watch as Chief Francois Paulette of the Smith’s Landing Treat 8 First Nation in northern Alberta discusses the impacts of Tar Sands on Alberta natives and calls on lawmakers to put a stop on the pipeline and tar sands extraction. The tailings (the leftover toxic waste) from the tar sands cover an area roughly 50 square miles and are growing by 80 Olympic Sized swimming pools every day. With every barrel of oil that is created from the tar sands, two barrels of toxic waste are also made. Over the course of a year, these tailings ponds leak over a billion gallons of toxic contaminated water into the environment. It should come as no surprise that the local First Nations who survive on subsistence living are now experiencing overwhelming rates of rare cancers and various illnesses. This project has changed their entire way of life. The most destructive project on the planet is not cheap. Over $200 billion has been invested in the tar sands and American investors have forked over almost 60% of that. Instead of investing in solutions for a clean energy future, America is investing in one of the world’s dirties and most toxic fuel sources. Unfortunately, it is the First Nations peoples who are being forced to pay the biggest price as their homelands are destroyed, contaminated and transformed into sacrifice zones for oil consumers in the US, Canada, and other oil-addicted countries across the world. The social ills, cultural consequences and environmental impacts are having an irreparable effect on the land and the indigenous way of life. Don’t stand for it. Take action now. Stay tuned for Part 2 of this story next week.